Yes, last night I made a very nice dream, I was walking with my girlfriend when an alien spacecraft has "kidnapped" us, we was scared, but they said that they was taking us in their home planet, after a while, we get in a amazing ringed planet, it was blue, and like a very big ocean, but that was a very strange quadruple system, we landed in a very futuristic city, and we get out, that was amazing, very dark sky, and the first thing we saw is two very near yellow stars, and, a bit farther an amazing blue star (I think that planet had something like a "shield" to protect from gamma rays). We was walking into the city and the aliens was talking about our planet, that we must do something to avoid the destruction of the biosphere, we was a little confused, but we understood, and then, the fourth red star has risen, it was starting to be hot, and the sky turned orange, but it was amazing, the aliens explans that even if we are not very important for this world, we still can do something great, but unfortunately, the dream ended. and what was the great idea that came from that dream? What movie is that from? Looks interesting. 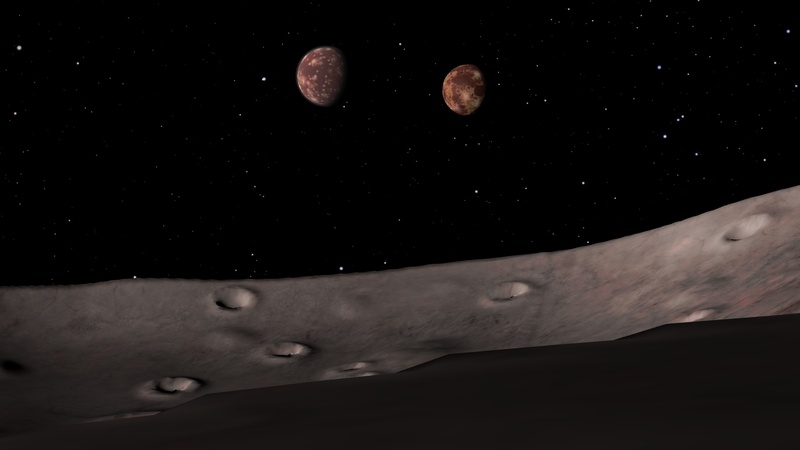 Many years later I was really scared when new moons of Pluto were discovered - Nix and Hydra. I added them immediately to Celestia and wasn't surprised that Pluto and Charon size in the Nix's sky matched with my dream. I don't normally like to write on very old threads (it was one of my first) Also I always avoid to double-post on the same section, but this is too much! I usually read Wikipedia articles about new interesting exoplanets, or, if I don't do that, I search for them on the internet. I don't know why I didn't do that for Gliese 667C c, or, if I did, I did it long time ago (before if was confirmed). It's the most abitable confirmed exoplanet, actually. In the beginning I imaginated the red star rotating around the 2 yellow stars, as you can see from the first version of the addon, then, for realism reason, I changed the structure of the system a little bit. Now that I read about GJ 667 system, I realized it has more or less the same structure! The only thing that is missing is the blue star (that's why 75%), but still, it's an awesome coincidence!